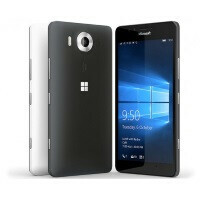 If you were thinking about getting the Microsoft Lumia 950 on-contract from AT&T, now would be the perfect time to do it! Amazon is currently offering the smartphone free of charge if you're willing to sign a two-year contract with the carrier. Usually, the Lumia 950 is priced at $149.99 when purchased on-contract, making this a solid deal for Windows 10 Mobile fans. The Microsoft Lumia 950 is a well-rounded smartphone which behaved well during our tests. The Windows 10 Mobile handset features a 5.2-inch display with a resolution of 1440 by 2560 pixels, a Qualcomm Snapdragon 808 chipset with a hexa-core CPU, 3GB of RAM and 32GB of expandable internal storage. In the imaging department, the Microsoft Lumia 950 comes with a 20MP primary camera with OIS and Carl Zeiss lens and a 5MP shooter on the front. Before committing to a purchase at this discounted price, we recommend that you take the time to read our full Microsoft Lumia 950 review and learn of the phone's pros and cons. Buyer's remorse is impossible to get rid of, but this way, you might be able to keep it to a bare minimum. What do you guys think of Amazon's offer? Are you interested in getting the Lumia 950 free on a two-year contract with AT&T, or have you openly embraced the era of the unlocked smartphone? That's a good deal! Now making phones from Tmo look expensive. Quite possibly! I wanted to get one anyway so by all means a wonderful deal! If u have win 10 on your computer and haven't experienced it on mobile. Buy one you will be amazed at the integration of mobile and desktop ui. And for apps wait for one year, at the rate win 10 tabs are selling. We will have developers making apps for windows again. Hats off to the bravery of microsoft mobile fans. When microsoft mobile division itself has given up the hope, the fans still believe in some miracle in few more years. If Microsoft has given up the hope, they wouldn't still be makong windows phones. Aren't the fans who make a company successful in sales? So what's wrong if Windows fans show support for Microsoft? Fools are the most confident people in the world. It takes some time for them to understand the nature of defeat. Those who think themselves are smarter have the least confidence and faith in the world. It takes time for fools to succeed and the smart people turned to follow. That is why number of users using windows phone has decreased from 3.4% in 2013 to 2.6% in 2015. Atlest those 0.8% where smart enough to understand the mistake. but still kudos to remaining 2.6%. Let's see hiw many of them open their eyes and when.